Were you able to guess when this week’s Flashback Friday photo provided by the Missouri History Museum was taken? 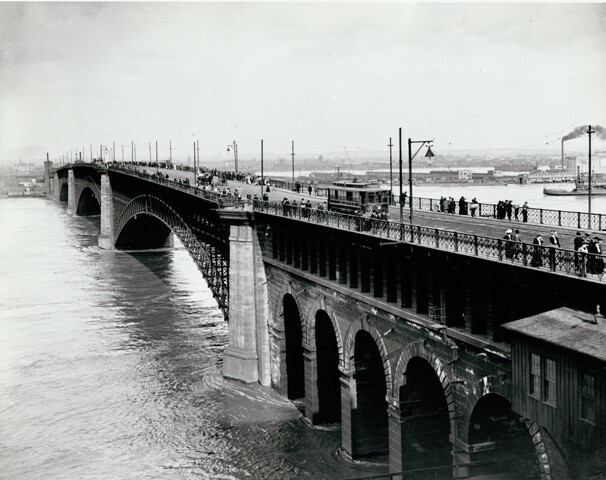 This photo of the Eads Bridge was taken in 1903 from a building on Laclede’s Landing. The trolley line that linked St. Louis with East St. Louis stopped running across the bridge in 1935, and the rails were removed from the surface level in 1942. The river crested at 38 feet that year and the bridge was an extremely popular gathering spot for locals to view the flooded river. 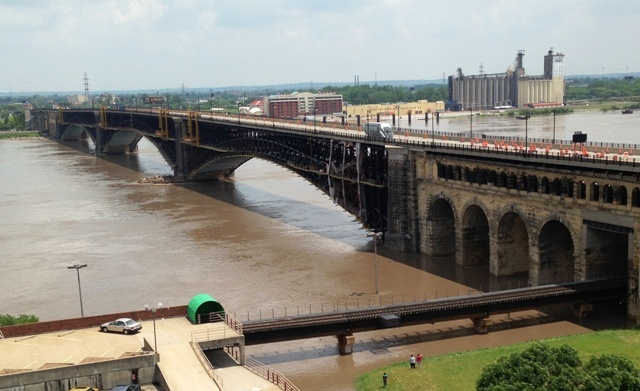 The 1903 flood did the most damage at East St. Louis, swamping the riverfront railyards and inspiring the construction of the first levees on the Illinois side. And here’s a photo of the bridge and current flooding on the Mississippi River taken yesterday.